Sartorially minded gentlemen who enjoy the classical style are much less likely to reject double-pleated pants on the basis of traditionalism. Those tiny tucks of fabric, between pocket and fly, which add an extra inch of material to each leg, can create more room and comfort. Think back to the wide-leg, double-pleated trousers that the Duke of Windsor used to don. He was rarely seen without his trusty pair — often styled with a lightweight double-breasted cream jacket and denim shirt with a patterned tie — particularly during his time as Governor of the Bahamas. After his abdication, he was exiled to France and would be part of both the authentic royalty and Hollywood kind that colonised the French Riviera in 1940s and 50s. Along with one of Tinseltown’s definitive leading men,Cary Grant, they sported high-waisted double-pleated trousers with slim-fitting retro design polo shirts, tucked neatly of course. 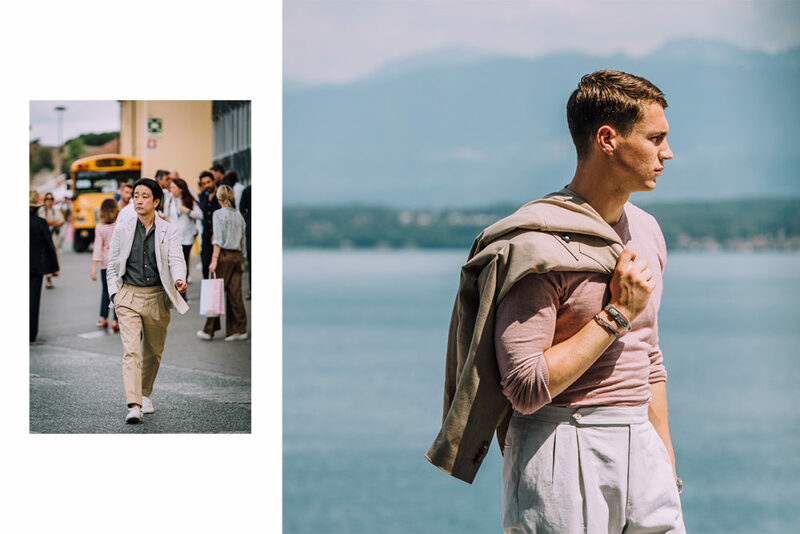 A similar combination for this summer that could evoke that traditional and yet contemporary look would be the Rubinacci Manny pleated cotton trouser, worn with a linen and cotton knitted Derby Shirt from Mc Lauren. 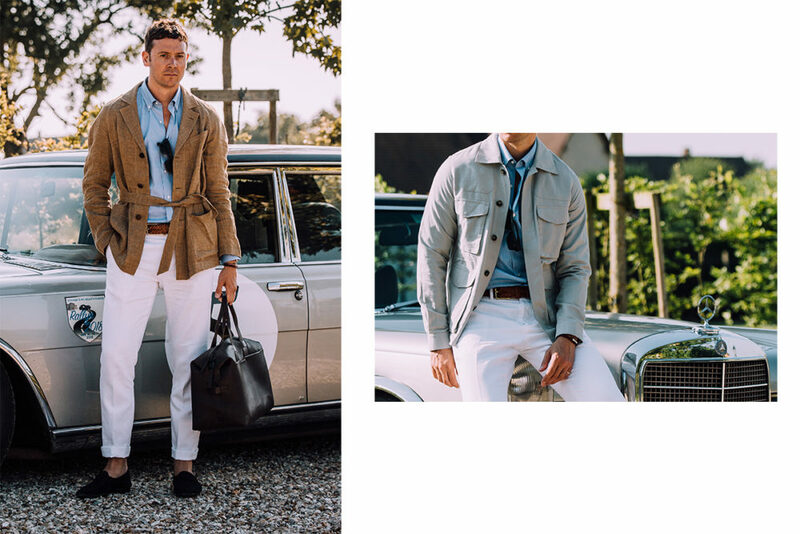 Historically known as 'sultans', when they were created out of necessity due to wartime fabric rationing, flat-fronted chinos are a staple wardrobe component for summer. Once popular in middle-America, they made an epic comeback in the mid-90s. The flat-fronted construction makes the silhouette smoother and straighter, creating a more streamlined look that is optimal for the slimmer gentleman but can sometimes struggle to comfortably contain a larger man’s seat. The specifics can vary, but today the Magnus & Novus brushed cotton ‘weekend’ chino offers a casually sartorial option. They feature a flap pocket on the hip, adjustable side tabs, side pockets, a waistband split for additional ease of movement, and for that finer detail — a button fly, with an extended waistband held in position by a single button and loop. To dress them down simply add a turn-up or two and go sockless with a pair of loafers or even espadrilles. ‘The King of Cool’ Steve McQueen was a major advocate of the flat-fronted chino. Despite being the highest paid actor of his generation, his style would evoke absolute simplicity, often pairing the trouser with linen shirts and a light Harrington jacket. 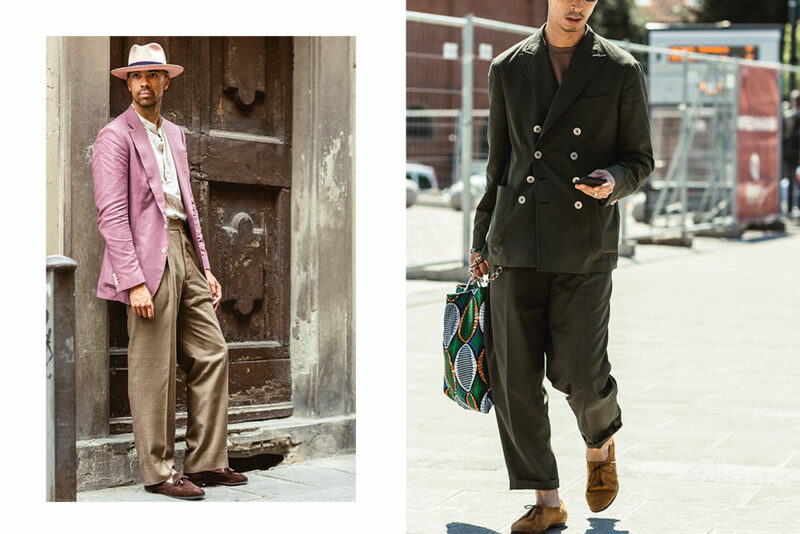 Men’s wide-leg pants started in the mid-20s (commonly referred to as ‘Oxford bags’) and narrowed down into the 1950s. In more modern times they came back as a subtle alternative to the 1970s flare, and were worn by the likes of David Bowie. Today swapping your skinny jeans for this style could be strangely liberating and is no longer a risk. The volume of these wide high-waisted trousers lend a nonchalant yet measured approach to dressing. Many wider trousers have traditional front-pleats and a higher waist; tuck the top in to highlight this feature. 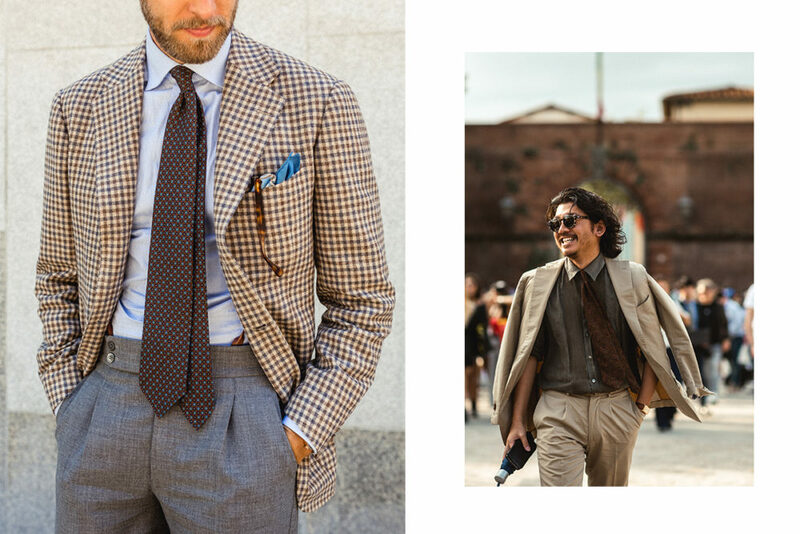 In the 30s, pants typically matched a suit jacket and today this can still be achieved with a pale linen suit, with a 70s-style shirt that is unbuttoned down to the chest area. A certain Marlon Brando would epitomise the casual look, often combining the trousers with his renowned white t-shirt and some well-worn brogues. To avoid any shoe being drowned by that striking silhouette, beefy Tricker’s could be the ideal footwear, but for a much more casual vibe, think about a sandal from the likes of Grenson. 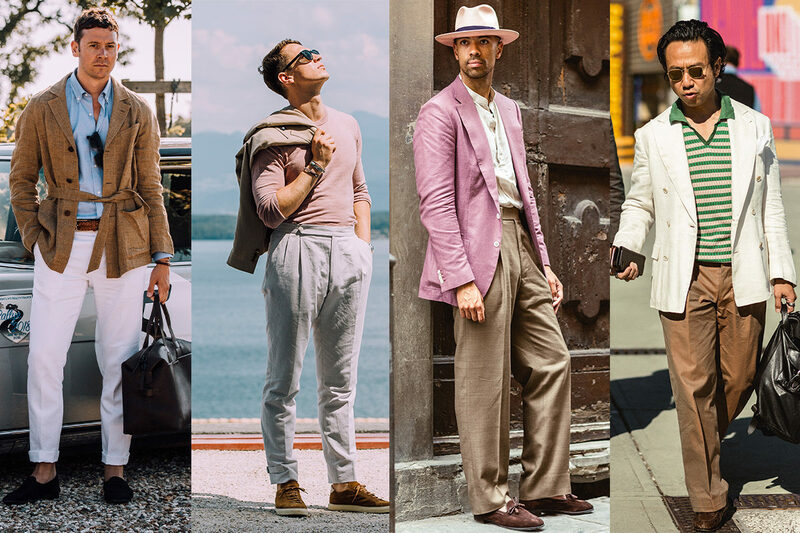 Single-pleated trousers might have been your grandfather’s pants-du-jour back in the day, but don’t let memories of the old boy’s dress code put you off. This elegant trouser is having a mini-renaissance and in the summer really comes into its own. One way to style them is by channelling your inner Neapolitan and opting for rear-facing pleats. These boast a looser shape because the extra cloth is taken from outside of the hips and casts less of a shadow in comparison to forward-facing pleats. Pleats work best on high-rise trousers and should sit atop the hip – any additional fabric around the hips does your silhouette no favours. A classic example are the lightweight reverse-pleated cotton gabardine trousers, by the famed Neapolitan trouser-maker’s Ambrosi. While these create room on the waist, the gently tapered leg allows you to wear a more discreet and supple loafer, such as one offered by their fellow Neapolitan tailoring titans Rubinacci – the dark brown Marphy loafer. This is not to knock the more traditional British forward-pleated trouser. There are merits to both styles. The forward single-pleat is often considered the neater of the two, so if you’re looking for a more formal look, say for a wedding, it might be best to be British.